May 10, 2005, L. G. Crabo. 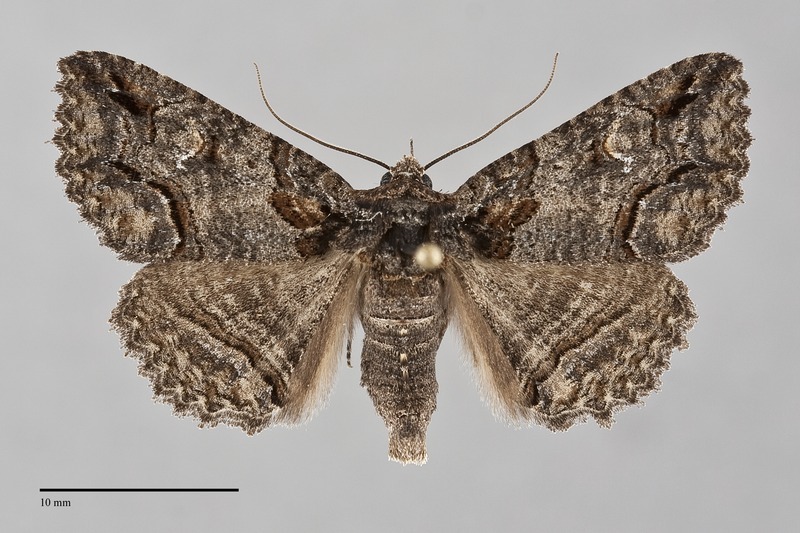 Zale termina is a relatively small and dark Zale (FW length 16 - 19 mm) found in western Oregon in our region. Both wings are scalloped at the margin and are similar dark brownish gray with a slight purple tint. They are finely streaked with multiple thin lines, most consistently on the hindwing. The area basal to the antemedial line is dark reddish brown, as is the thin space between the postmedial and subterminal lines. As in other Zale species, the antemedial line is angled toward the wing base posteriorly. The postmedial line is smooth, with two lateral bulges near the reniform spot. The subterminal line is more jagged, especially at the apex and just posterior to the level of the lower reniform spot where it juts toward the outer margin. The reniform spot is crescentic, with the area distal to it light ochre. The hindwing is similar to the forewing except that it lacks a dark base, and the brown-filled double subterminal line is nearly straight. The thorax is dark brown, with strong posterior tufting. The antennae are simple, finely ciliate in males. This species is most similar to Zale rubi. 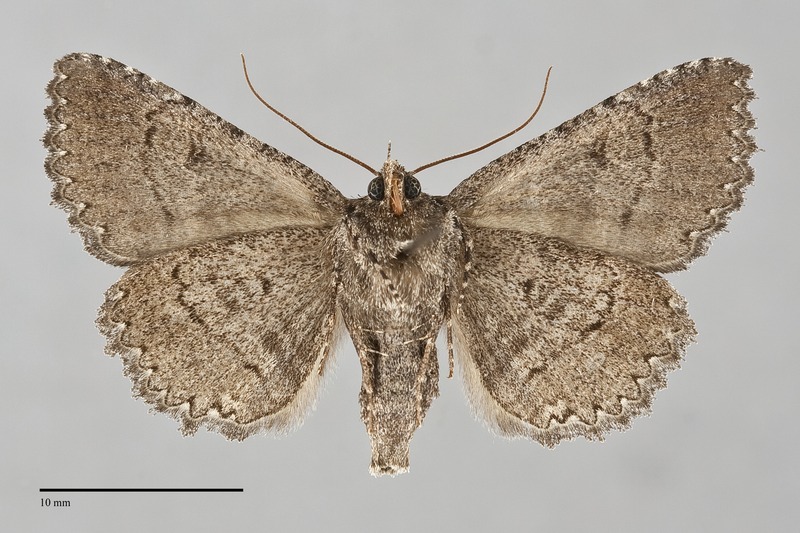 This species is lighter gray-brown rather than purplish gray and tends to be slightly larger than Z. termina. It lacks the light yellow-tinted patch distal to the reniform and its hindwing subterminal line is more irregular, as if drawn by someone with a tremor, rather than smooth as in Z. termina. Larva is smooth, gray with dark longitudinal lines, and with a scalloped black subdorsal line. It is illustrated by Miller & Hammond (2003). This species occurs in oak forests of the Southwest and southern Rocky Mountains, and disjunctly along the West Coast in California and western Oregon. In the Pacific Northwest, it is common in mixed hardwood-conifer forests of the Siskiyou Mountains, Coast Range, and along the west slope of the Cascades at middle elevations in Oregon. This species is considered to be management sensitive, depending on live oaks and chinquapin as larval foodplants. This species is distributed south of our region in California. The range extends east to southern Colorado, New Mexico, and western Texas. Along the West Coast, this species is a foodplant specialist feeding on evergreen Fagaceae including canyon live oak (Quercus chrysolepis) and golden chinquapin (Castanopsis chrysophylla). However, in the Southwest and southern Rocky Mountain regions, it feeds on deciduous Gambel oak (Q. gambelii). This suggests that the Southwest and West Coast populations may be distinct ecological subspecies if not distinct species. Zale termina flies in late spring and early summer. Records in our region are from mid May to mid June. It is a nocturnal species and comes readily to light.